Whether you’re a geek with a packrat streak or an organization with a closet full of old computers, next week brings a valuable opportunity to safely and responsibly dispose of your unwanted electronics — free of charge. The University of Hawaii is hosting its “Biennial Education & Government eWaste Disposal Days.” There are separate drop offs for individuals and institutions (public or private schools, government or military agencies, businesses of less than 100 employees or non-profits). Ewaste includes computers, printers, copiers, scanners, cell phones, and many other things… but not CRT monitors, microwaves, batteries, and the like. Be sure to review the detailed list of acceptable ewaste items [PDF]. Institutions must pre-register to drop off ewaste, but once doing so, drop-offs will be accepted at all locations on Friday, Oct. 29. In addition, early drop-offs will be accepted at the Burns School of Medicine beginning Wednesday, Oct. 27, as well as on Thursday, Oct 28 at UH Hilo and Leeward Community College. If you’re recycling hard drives, be sure to scrub them of any sensitive data! For more information, check out the UH eWaste Disposal Days website. Actually, they will take CRTs, just not cracked or broken ones! 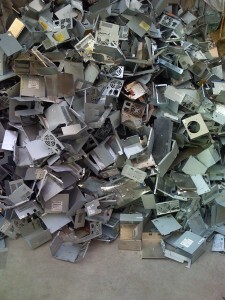 That’s great information, specially as it becomes increasingly difficult to recycle e-waste. Mahalo, Ryan.